LO for DGS. I'll add journaling to the blank rectangle. I see the holly slipped and is covering the "s". I'll have to fix that. I lifted the idea of the corrugated cardboard cut to resemble ice-sickle form Robin of robandtim2. You can' see it but I sprinkled some glitter on it to make it look sparkly. The pattern papers are Authentique. sb.com doesn't have them. Pine-cone, and title cut with Silhouette. Really cute layout! Love the corrugated paper! I love the addition of the corrugated paper and how you used it! Nice page! beautiful layout & photos! Everything is stunning with the contrast of red. What struck me first off was how the corrugated torn paper looks like snow hanging off the eaves of a house. Love all the papers and the design! Very pretty layout! Love the papers you used! I love the corrugated cardboard too Cathe and the way you did the paper tear. The grandchildren look so happy especially Kian with the car! I always love the way you list what you get for the grandchildren. Nice memories for them to look back on someday. Nice layering. 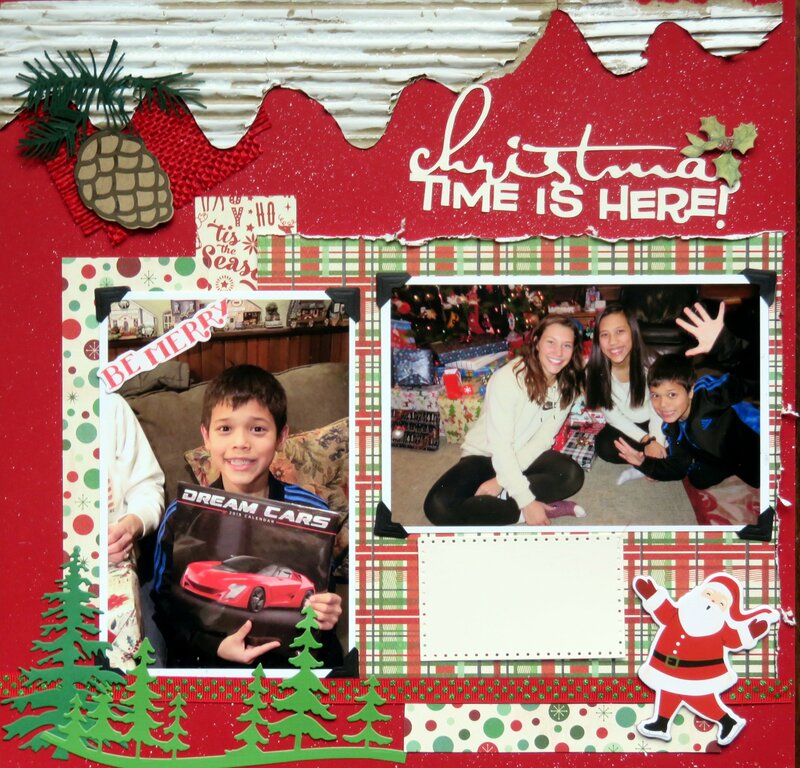 Cute Christmas layout. Love the papers and the trees! Love the cardboard on this! You always do such a great job with all of your paper layers!